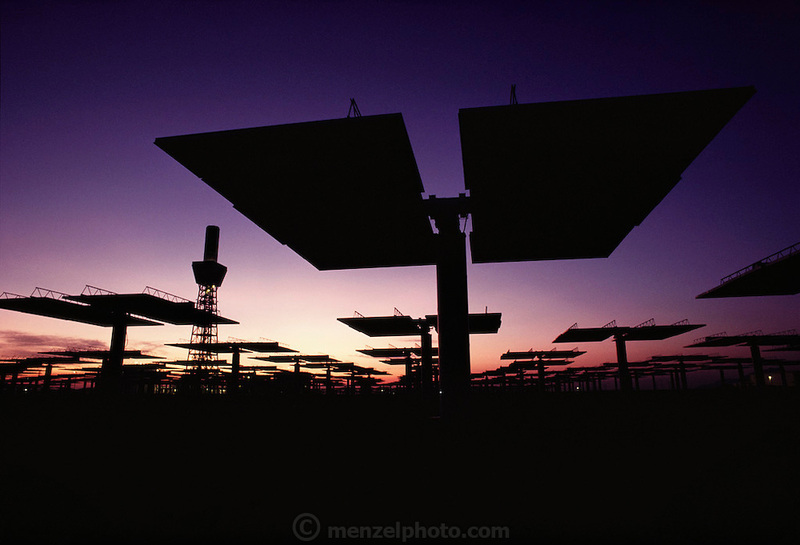 Solar energy electrical generating power plant in the Mojave Desert near Barstow, California. Solar One consists of a circular arrangement of 1, 818 mirrors, each measuring 23x23 feet (7x7 meters). These mirrors focus the sunlight onto a huge central receiver, which sits atop a 300-foot (91 meter) tower. The mirrors are computer controlled to track the path of the sun. Water is pumped through the receiver and heated to a temperature of 960 degrees Fahrenheit. The resultant steam runs a turbine, producing 10 megawatts of power for eight hours a day. (1982).